A loose key joint named for it's shape like a butterfly. Also known as a Dovetail Key Joint. Used mainly in remedial work to stop timber splitting.. 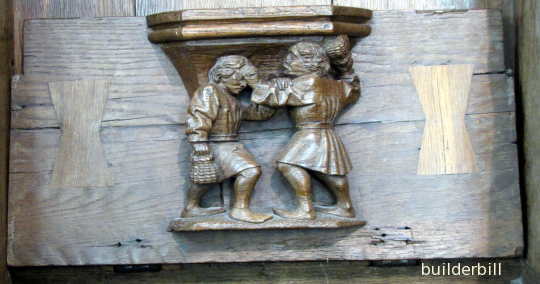 Above is an Oak Misericord in the Oude Kirk in Amsterdam. At some time after the middle ages when it was made wear and tear and rough handling caused the seat to split and some joiner has repaired it buy jointing it with two dovetail key joints. This is the main use of these key joints. Either for repairing damage or setting them in above a a split to stop the split growing and causing problems. They are also now being used as a feature to modern large slab table tops to give the impression of old style rustic quality. Note! A Misericord is a ledge under a folding seat of a church pew. The idea being that when standing was required during long services, then the small bracketed ledge was there to lean-sit on to relieve the weight on the legs. The are typically ornately carved and in the tradition of the middle ages when they were created they were highly individual expressions of medieval craftsmanship. 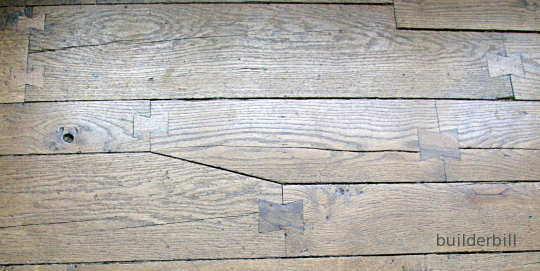 Above is an oak floor in the 12th. century Leeds Castle in Kent England. I have no information to back this up but I am guessing that this floor was laid in the time of Henry Vlll. It is certainly pre-industrial revolution. This is the exception to every other dovetail key that I have every seen, in fact and in publications, in that the key joints are parallel to the grain rather than placed across it. In every case of an end to end key joint that I have done and seen a variation of the hammer headed joint on the next page has been used. Of course the dovetail key joint is not restricted to woodworkers. The photo below shows a joint in a coping that uses one. Many times the key slots are cut out on both coping stones and then the key is formed by pouring in molten lead. In this case lead has been used to tighten up the joint, probably after damage. 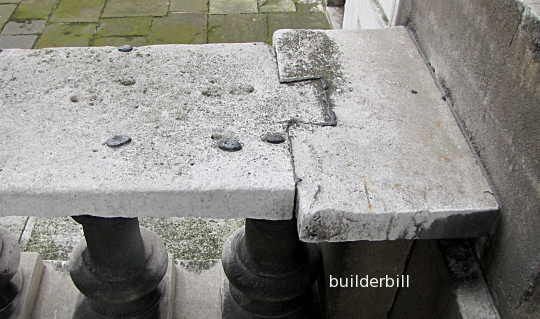 This is on one of sir Christopher Wren's buildings at Greenwich in the UK.